I wrote the following article on Calgarian Chris Reitsma, and it's been published on the Canadian Baseball Network. 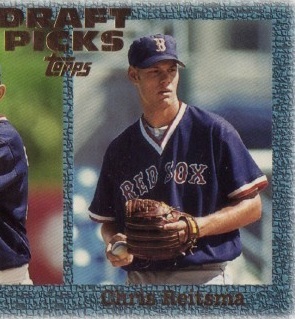 My interest in Reitsma, is not only that he's a major league ballplayer from the city I live in, but without his knowing it, he was a big part of my decision to move here. My employer had asked me to transfer from Toronto and I was reluctant to do so. Even though it would be a good step for my career, I'd have to leave all my family and friends behind. I was deeply conflicted. I used my analytical skills and made a detailed spreadsheet complete with weightings of different criteria. I added up all the pros and cons and it was as dead even as could be. Lots of new opportunities if we moved, but it was a risk. The night before the decision was due, I didn't sleep well. I had a tough choice to make and still didn't know which was I was leaning. Then, on the train ride while commuting into work, I was reading in the USA Today the results of the MLB draft, and noticed that the Red Sox had drafted a Calgarian with their first round pick. That was the sign I was looking for to help me make a decision. That day I committed to transferring out west, and have been here ever since.